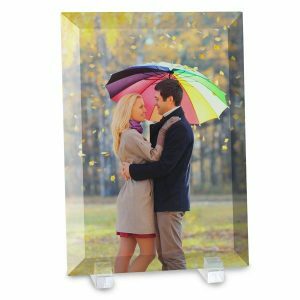 Whether you are looking to add a unique flair to your living room or simply want to brighten up the look of your bedroom, we offer a wide range of home décor products that can be personalized with your favorite photos and customized text. Select from a range of styles and templates, and design something special for your home or a loved one’s. No matter the occasion, our collection of cheap personalized photo gifts are an affordable and stylish way to showcase your brightest memories! For even more unique ideas, check out our other custom photo products to celebrate your finest pictures! With Mother’s Day around the corner, it’s time to start thinking about personalized gifts for Mom. Our home decor collection includes an array of options that are perfect for enhancing Mom’s home while celebrating her favorite photos. 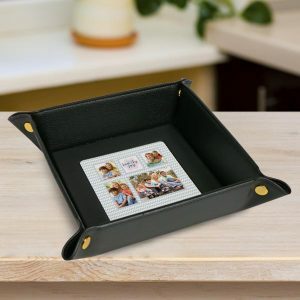 From personalized photo keepsake boxes to beveled glass photo prints, you can upload a favorite photo and use it to create meaningful gifts for Mom this year that she’ll hold hear for years to come! In addition to personalized Mother’s Day gifts, we also offer customized Mother’s Day cards that you can design for Mom to go along with a custom creation that you design yourself! Our convenient project builder allows you to effortlessly customize everything from blankets to keepsake boxes. Gather your favorite digital photos and let your creativity flow. Build the perfect home décor accent that compliments your style and provides you with year after year of enjoyment. After gathering your photos, upload them into your account from your flash drive or computer. Once you choose your home décor product, select your background template and photo layout. Simply drag and drop your photos onto your layout and even add your own text using the project editor. Then, place your order. It’s that simple! Once you receive your order by mail, add it to your current décor collection and enjoy your new, updated look. Your favorite memories are guaranteed to add a unique and personalized flair that just can’t be beat! Adding photos to your décor can brighten your day and will uplift the look of any room, no matter the style. We offer a range of custom towels that are sure to show off your best pictures in style. Design a personalized towel and select a custom background color or pattern that fits your décor. Our photo collage beach towel is perfect for not only your next family getaway, but also your bathroom at home! You can have them printed horizontally or vertically and they are available in a variety of photo layouts to make your memories stand out. Design your own set of bath towels to add color to your bathroom or create ultimate beach towel to take with you on your next beach vacation. Compliment your bath towel with our soft customized hand towels. They make a great addition to both your bathroom and kitchen. Keep one hanging by your bathroom or kitchen sink for easy access and dry off your hands in elegance after washing up or doing the dishes. Add a little color and personality to your daily wash routine with our photo washcloths. Customize your new washcloths to match your bathroom décor or our personalized photo hand towels and bath towels for a complete matching set. Showcase a fun photo and even add your own text for added flair. 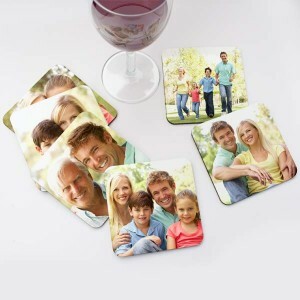 Decorate your kitchen or dining room table with memories and create your own custom photo table runner. Our table runners are made from a vintage style burlap that will fit perfectly with any décor. Add a collection of favorite family photos and your own family quotes to really make your table setting unique. Create a table runner that matches your distinctive style by selecting from our bevy of customized options and templates. Stay cozy and warm along with your most treasured memories! Create photo blankets cheap to compliment your decor and make your home inviting. We offer a a variety of sizes and materials to fit your style including various photo collage layouts and background patterns. Add a cozy touch to your bed or living room sofa with our plush fleece photo blankets and customized fleece blankets. Made from the thickest fleece, our plush fleece blankets provide maximum comfort and are available in multiple sizes. Design one for the perfect couch throw or make one to keep by your bed and dress up your décor with your best memories. Our regular fleece option allows up to nine different photos and makes a great baby blanket or bed throw. Our Jersey fleece photo blankets also make a great addition to any home. With its soft, sweatshirt-like feel, our jersey fleece blankets are available in three sizes for the perfect baby blanket or customized bedspread. Design your own memory collage and print your jersey fleece with your most cherished digital photos. Relax comfortably at home with our customized photo Sherpa blankets. Measuring 50×60, it is the perfect size to snuggle up with on your living room sofa or favorite family room chair. Select from various portrait and landscape layouts or design your very own to display your photos in style. Our woven tapestry photo blankets also make a great addition to your home décor. With their classic woven look, you can add color to your sofa or even hang them on a wall for a cozy, rustic look. Our woven photo blankets are available in two sizes and also make a unique gift for any occasion. You can’t go wrong with displaying your best photos as part of your wall décor. Relive a favorite memory every day and display it as wall art to add color and personality to the style of your home. Not only can they displayed on your bookshelf or end table, our photo desktop plaques are perfect for displaying photos on your walls. With their glossy surface finish, they are sure to add a modern, updated look to your décor. Print your favorite wedding photo or professional family portrait on our desktop plaque and enjoy your memories on an elegant, lustrous surface. Are you looking to make a décor statement? Maybe your basement recreation room has no windows and you want to give it a stunning view. Our custom backdrop murals are a great way to show off an attention-grabbing photo and fill up a whole wall with color. Measuring 8 feet by 8 feet, you can print an amazing tropical or ocean side landscape photo and instantly turn any room into a far-away paradise. With a choice of six different sizes, you can design the perfect custom photo floor mat for any room of your home. Add snapshots of your family and pets for a fun gallery of photos showcased on your floor. In addition to your home décor, our large area floor mats are great for businesses. Print your logo and customized text to give your business that professional look. Our selection of customized pillows is perfect for adding a cozy, colorful update to your living room, bedroom or den. We offer multiple options that are tailored to any décor and make a stunning addition to any part of your home, both indoors and out. Choose from one of our popular photo burlap pillows or decorate your patio with one of our outdoor pillow options. Each pillow can be customized with a collage of your best pictures and personalized text to draw attention from family and houseguests alike. Select your size, upload your pictures and create a stunning pillow for the ultimate décor accessory! Personalize the look of your bedroom by incorporating your fondest memories into your decor. Photos are a great way to add your own personal touch to your bedroom sanctuary while waking up your best remembrances every morning. We have several cheap custom blanket options including various sizes, materials and photo layouts so you guaranteed to find something that’s just right. With our custom photo duvet covers, you can dress up your bed with your prized pictures and choose an elegant background that matches your distinctive bedroom décor. Create a stunning collage of your favorite pet photos or add a fun picture from your recent road trip to your layout for a unique and stylish boost to bed’s décor. 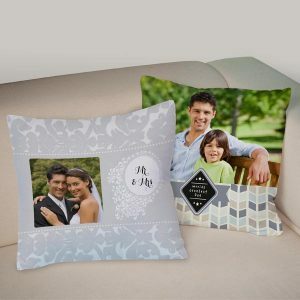 To match your new duvet cover, we also have personalized pillowcases with photos that are available in three sizes, perfect for any bed in your home. The options are endless! Your bedroom is your home’s most secure room and many of us store our valuables and jewelry there for safekeeping. Why not create your own custom keepsake box to store your prized possessions away on your nightstand. 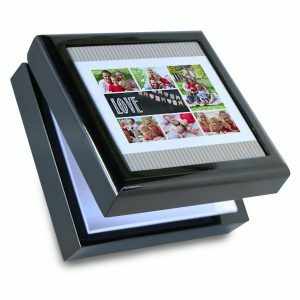 Our keepsake box is perfect for safeguarding your watches and jewelry while displaying your favorite photo. 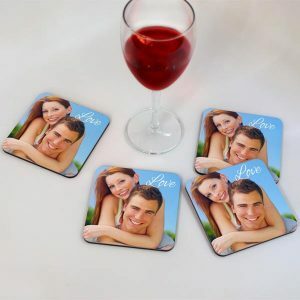 With its walnut stained finish and customized photo lid, they’re perfect for showing off your favorite, romantic photo of you and your love. Why stop at decorating your living room, kitchen and bedroom. We also offer bathroom décor that is sure to brighten your daily routine. Turn your bathroom into a fun display of colorful pictures and even add your own text for a more personalized look. Adding both comfort and safety to your bathroom, our custom photo memory foam mats provide a soft, cushioned surface for your feet when you get out of the shower. Sized perfectly for any bathroom, they can also be designed with a background template of any color palette to match your bath décor and compliment your photos. Are you tired of the same old shower curtain that does nothing to dress up your bath area? Instantly update your bathroom with our custom made shower curtains! Like our other bathroom accessories, you can design your shower curtain to match your towels and bath mat for a cohesive look. MailPix also offers several home décor options for the holiday season. Decorate your living area with your digital photos and add a little holiday cheer to your celebration. If you are looking to dress up your mantle, check out our custom photo holiday stockings. We offer a range of styles, colors and photo layouts so you can design the ultimate holiday stocking for each member of your family. Maybe you are looking to add a personal touch to your Christmas tree instead. We have a full selection of photo ornaments that are sure to compliment your carefully decorated display this year. Go vintage with our custom aluminum ornaments or add a cozy, rustic touch with our photo printed wood ornaments. We have an ornament design for everyone that will transform your Christmas tree into a gallery of your favorite family memories! Whether you prefer simple and modern, or you like warm and rustic, our collection of home décor gifts and accessories are guaranteed to please, no matter your style. Add color to your bathroom with our customized shower curtains, or spice up your recreation room in the basement with our large area photo floor mats. With so many photo layouts and templates to choose from, you can create an amazing décor accessory that’s totally “you”!